As reported in Eater, a new spot for the Dockers and ESPN set on Bleecker St. Oddly, nothing seems to rouse the passion of commenters like a downtown sports bar. But this one serves forties! In paper bags! How droll! The Other Side, an old haunt in TLOTB&TC used to offer 40s of Schlitz, but they catered to a hard-working thrifty drinking bike messenger crowd. Here, to judge from the photo, the crowd skews a little bit more white collar. Still, I could live with the 40s in this context -- there is a recession on, and all, were it not for the bags. You'll notice when you get the bottle of Chateau d'Yquem at a place with tablecloths, they don't give it to you in a bag, because they expect you will drink it indoors. 40s conversely, are often consumed outdoors, and often in places where the consumption of alcohol is illegal. The bag is a nod to the law, in that one might be drinking something non-alcoholic out of a bag. Or so it went in the pre-Giuliani era. To elaborate, the people who consume 40 ounce containers of beer or malt liquor outdoors frequently do so because they do not have the convenient access to the indoors that comes with a lease or a mortgage. Still with me? Good. 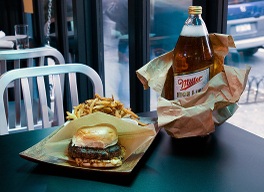 The flourish of the 40 in a bag at a restaurant is thus a cute way of nodding to the beverage format's popularity with the poor and dispossessed, who do not, as a rule, frequent Village sports bars. Get it? Me neither. Also, viz the thread on PX This that inspired the visit, one is left wondering if Gawker commenters are the "creative underclass," what do you call people who put this much effort into hating on Eater? If Jurgen Habermas were dead, he'd be spinning in his grave.